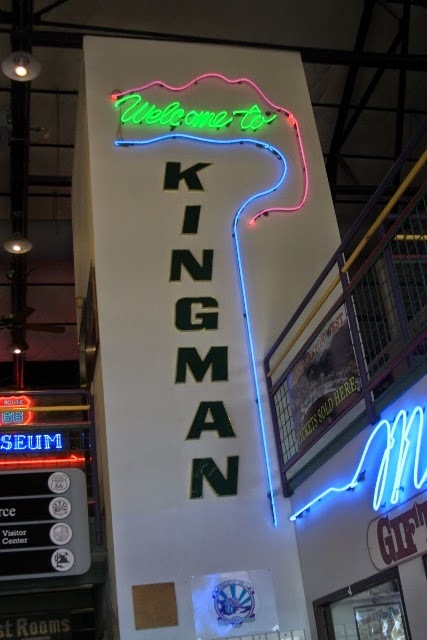 Back around 1946, Nat King Cole crooned a catchy little tune about a highway signed with two sixes that mentioned a town named Kingman. In spite of that rather obvious promotional leg up on other communities along the Route 66 corridor, that highways renaissance had little affect on dusty old Kingman. That, however, is changing, and in a very big way. It is also happening with a speed that is almost dizzying. Last evening the Route 66 Association of Kingman held their monthly meet and greet at the venerable old Sportsman’s Lounge, a pre-territorial era saloon. As conceived, these monthly events are more about networking and fostering a sense of community than adding to the membership roster or advancing an agenda. From that perspective it was a raging success. The president of the Kingman Downtown Merchants Association was in attendance, as was Liza Noland, one half of the team from Ignite Marketing that developed the innovative pooled resource marketing program Kingman Circle. Also in attendance was the city manager, Mike Wagner, host and producer of the new radio program Live From Kingman, business owners, folks curious about Kingman events, real estate agents, a couple of tourists, and Matt Phillips, owner of Legacy Signs that has just invested in the equipment to restore or create neon signs and relocated his business to the historic district. Earlier that afternoon I provided assistance to Gerard Ramalho and his crew News 3 in Las Vegas, an NBC affiliate, that was working on a series about Route 66 between Amboy and Williams. My role in the affair was to serve as their guide and to share the stories about some of the more famous people associated with Kingman. Here is a link for the segment featuring Kingman and Seligman that includes an interview with the world’s most famous barber. There was also a brief meeting to discuss marketing strategy with Joel Zubaid, one of the owners of Ramada Kingman, a 1960’s era Holiday Inn that draws closer to becoming the cities only full service Route 66 resort. There are kicking off a Route 66 photo contest (details are on the home page) and expanding on the tour packages currently offered. Of course Kingman is but one of the quirky neighborhoods in the linear community that is Route 66, an apt analogy. Another neighborhood that has piqued my interest of late is Leasburg, Missouri, home of the delightful Belmont Winery. Rumor has it that they may be introducing a limited edition wine to celebrate the 90th anniversary of Route 66. If your unfamiliar with this delightful little oasis located just east of Cuba, stop by. In addition to a wonderful and unique wine list (pink dogwood and edelweiss top our list), they also have an interesting menu for dinner. If you stop by, say hello to Trish on our behalf. To close this out, here is another chapter in the Your Story series. Don’t forget to send you Route 66 stories, you just might win a copy of Travel Route 66. Today’s story from Bob Walker and Lorrie Fleming tells about the founding of the Canadian Route 66 Association. “In May, 1994, Bob & I were traveling from Santa Fe, New Mexico heading west on I-40 in Arizona and noticed a sign posted on the freeway in Arizona that indicated “Historic Route 66” – next exit right!